This isn’t the finals, but it is a battle of champions! 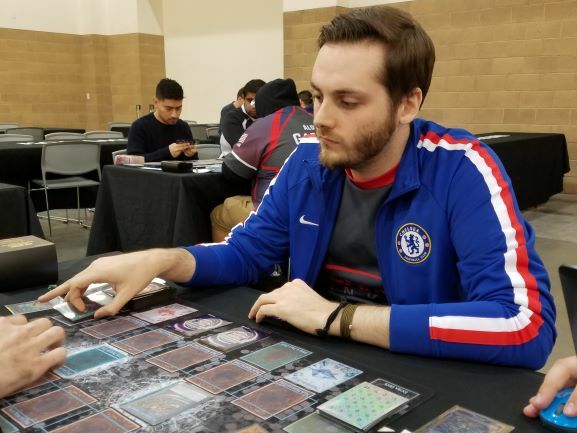 Michigan’s Jeff Jones is a UDS Champion and a two-time YCS Champion! 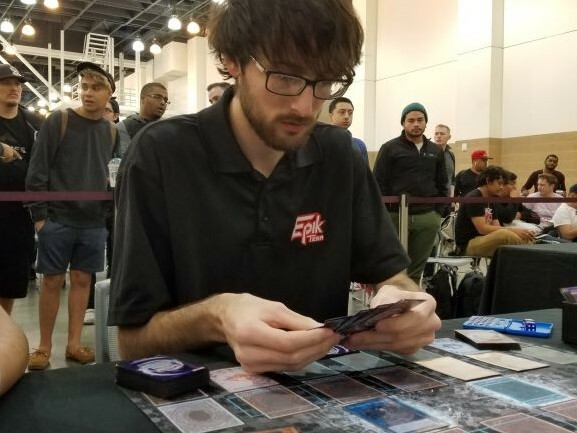 He’s using Sky Strikers today, facing off against Texan Duelist Cameron Neal. Neal is also a UDS Champion, having won the Summer Invitational this year. 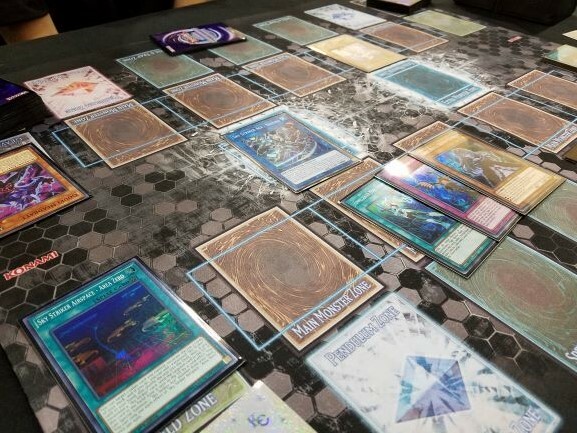 He’s using a Gouki Deck, just like he used to win his UDS championship belt. 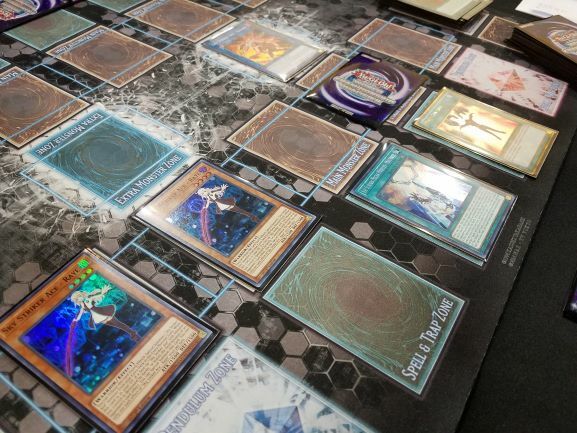 Jones won the dice roll and chose to play first, opening with Sky Striker Airspace – Area Zero, Sky Striker Ace – Raye, Ghost Belle & Haunted Mansion, Sky Striker Mecha – Hornet Drones, and Foolish Burial Goods. He started off with Hornet Drones and Area Zero. He used Area Zero’s effect on the Sky Striker Ace Token, adding Sky Striker Mecha – Widow Anchor to his hand. Foolish Burial Goods sent Sky Striker Mobilize – Engage! to the Graveyard. He Normal Summoned Raye and used it to Link Summon Sky Striker Ace – Kagari, adding Engage to his hand. He activated it, adding Sky Striker Mecha – Eagle Booster to his hand. Kagari was used to bring in Sky Striker Ace – Shizuku, and he Set Eagle Booster and Widow Anchor. In the End Phase, Shizuku added Sky Striker Mecha Modules – Multirole to his hand. Neal began with Neo-Spacian Aqua Dolphin, discarding Gouki Headbatt for its effect. Jones flipped Widow Anchor to negate it and take control for the turn. Neal passed. Jones drew Twin Twisters. He Set it and activated Area Zero on it. He revealed Engage, and Neal knew the Duel was already over – he conceded! Neal played Instant Fusion to Fusion Summon Invoked Raidjin. He Normal Summoned Gouki Twistcobra, and Link Summoned Isolde, Two Tales of the Noble Knights. Twistcobra and Isolde added Gouki Suprex and Super Quantum Red Layer to his hand. Jones activated Droll & Lock Bird, shutting down any further searches this turn. Isolde sent Divine Sword – Phoenix Blade to the Graveyard, and Jones activated Ash Blossom & Joyous Spring to negate that too! Neal passed the turn. Jones began with Engage and two Widow Anchors, and drew Mind Control. He played Engage to add Raye to his hand, and promptly used it to play Kagari, returning Engage to his hand. He activated Engage again, this time searching for Eagle Booster. Kagari attacked Isolde, and both monsters were destroyed. Jones Special Summoned Raye from the Graveyard, attacking directly. He then used Raye’s effect to Special Summon Sky Striker Ace – Hayate, and attacked directly with that as well. Hayate sent Hornet Drones to the Graveyard. Jones Set all of his Quick-Play Spells, and used Hayate to play Shizuku. In the End Phase, Shizuku added Sky Striker Mecha – Shark Cannon to his hand. He activated it immediately to banish Twistcobra from Neal’s Graveyard. That gave Jones a third Spell Card in the Graveyard for his Sky Striker cards. Neal played Red Layer and Dark Grepher. Grepher discarded Knightmare Corruptor Iblee for its effect, and Jones negated Grepher with Widow Anchor, but did not take control of it. Neal used Red Layer and Grepher to play Isolde, and Jones negated Isolde and took control of it with his second Widow Anchor. He then used Eagle Booster to protect his Shizuku. Neal returned Phoenix Blade to his hand, then Set one card in his back row. Jones drew Ash Blossom. He used Shizuku to play Kagari, and Neal flipped Called by the Grave to banish the Kagari in the Graveyard, negating the new one. Jones Link Summoned Shizuku and destroyed Isolde in battle. In the End Phase, Shizuku added Area Zero to Jones’s hand. Jones drew Reinforcement of the Army. He used Shizuku to play his third Kagari, adding Engage to his hand. He activated it immediately to add Multirole to his hand, and he drew Foolish Burial Goods. He used Reinforcement of the Army to get Raye, then played Multirole. He activated Area Zero, using Multirole’s effect on the Field Spell. Area Zero’s effect Special Summoned Raye. He Normal Summoned the Raye from his hand as well, and used Mind Control to take Neal’s Set Gouki Suprex. That left Neal wide open, and the Sky Strikers finished off his Life Points! Jeff Jones is going to the Top 4 with Sky Strikers!